The Afghan War has now entered its 10th year. It has become the longest US war. As of 7 October 2010, the 9th Anniversary of the US invasion of Afghanistan, the human cost of the Afghan War has been estimated as about 4.9 million violent deaths or non-violent avoidable deaths from Occupier-imposed deprivation. 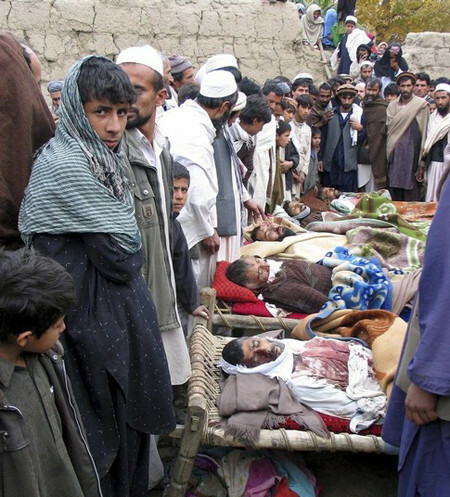 This photos shows villagers standing next to the bodies of civilians who they said were killed in a NATO-led attack in Armul village in Laghman province December 8, 2009. 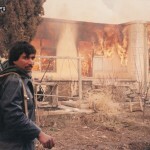 Thousands of innocent Afghan civilians have been killed in the war waged by foreign forces. The ongoing, US Alliance-imposed Afghan Holocaust and Afghan Genocide has now reached the dimensions of the World War 2 Jewish Holocaust (5-6 million dead, 1 in 6 dying from deprivation). Decent people around the world must continue to vigorously oppose this gross violation of Humanity. To assist such decent folk I have prepared a carefully documented Afghan War Deaths Fact Sheet as set out below and incorporating the latest information as of 7 October 2010. 21. Man-made global warming is a major problem for Humanity, together with nuclear weapons and poverty. The huge fiscal diversion for the Afghan War has crippled the political will of America to tackle man-made climate change. Both Dr James Lovelock FRS (Gaia hypothesis) and Professor Kevin Anderson ( Director, Tyndall Centre for Climate Change Research, University of Manchester, UK) have recently estimated that fewer than 1 billion people will survive this century due to unaddressed, man-made global warming – noting that the world population is expected to reach 9.5 billion by 2050, these estimates translate to a climate genocide involving deaths of 10 billion people this century, this including 6 billion under-5 year old infants, 3 billion Muslims in a terminal Muslim Holocaust, 2 billion Indians, 1.3 billion non-Arab Africans, 0.5 billion Bengalis, 0.3 billion Pakistanis and 0.3 billion Bangladeshis. The nations that need to curb greenhouse gas pollution most quickly and indeed achieve 100% renewable energy by 2020 if the world is to have a 67% chance of avoiding a 2C temperature rise (estimates by Professor Hans-Joachim Schellnhuber, head of the Potsdam Institute for Climate Impact Research, Germany) are indeed the worst polluting US Alliance countries, namely the US, Canada and Australia. “Annual per capita greenhouse gas (GHG) pollution” in units of “tonnes CO2-equivalent per person per year” (2005-2008 data) is 0.9 (Bangladesh), 0.9 (Pakistan), 2.2 (India), less than 3 (many African and Island countries), 3.2 (the Developing World), 5.5 (China), 6.7 (the World), 11 (Europe), 16 (the Developed World), 23 (Canada), 27 (the US) and 30 (Australia; or 54 if Australia’s huge Exported CO2 pollution is included). 23. The US Alliance is grossly violating Articles 55 and 56 of the Geneva Convention Relative to the Protection of Civilian Persons in Time of War.Article 55. To the fullest extent of the means available to it the Occupying Power has the duty of ensuring the food and medical supplies of the population; it should, in particular, bring in the necessary foodstuffs, medical stores and other articles if the resources of the occupied territory are inadequate. The Occupying Power may not requisition foodstuffs, articles or medical supplies available in the occupied territory, except for use by the occupation forces and administration personnel, and then only if the requirements of the civilian population have been taken into account. Subject to the provisions of other international Conventions, the Occupying Power shall make arrangements to ensure that fair value is paid for any requisitioned goods. The Protecting Power shall, at any time, be at liberty to verify the state of the food and medical supplies in occupied territories, except where temporary restrictions are made necessary by imperative military requirements. What must decent people do? Peace is the only way but silence kills and silence is complicity. Decent people everywhere must (a) inform everyone they can about the horrendous realities of the ongoing Afghan Genocide and (b) apply and urge intra-national and international Sanctions and Boycotts against all those people, politicians, corporations and countries complicit in this ongoing atrocity. UN Population Division data: http://www.learnstuff.com/world-population-resources/ .
. Just Foreign Policy: http://www.justforeignpolicy.org/ .
. Iraqi Holocaust, Iraqi Genocide: https://sites.google.com/site/iraqi... .
. UNHCR: Afghanistan: http://www.unhcr.org/cgi-bin/texis/... .
. UK Telegraph, 22 April 2010: http://www.telegraph.co.uk/news/wor... .
. UNICEF data on Afghanistan: http://www.unicef.org/infobycountry... .
. Polish Holocaust, Afghan Holocaust and Western Holocaust denial: http://www.countercurrents.org/poly... .
. WHO data in Afghanistan: http://www.who.int/countries/afg/en/.
. US casualties in Iraq and Afghanistan: http://icasualties.org/oef/ .
. Australian National Drug Research Institute, “Tobacco, alcohol and illicit drugs responsible for 7 million preventable deaths worldwide”, 2003: http://db.ndri.curtin.edu.au/media.... .
. UN Office on Drugs and Crime (UNODC), World Drug Report 2007: http://www.unodc.org/unodc/en/data-... .
. US foreign policy hugely supports global drug trade, Bellaciao: http://bellaciao.org/en/spip.php?ar... .
. Afghan Holocaust, Afghan Genocide: https://sites.google.com/site/afgha... .
. Joseph Stiglitz & Linda Bilmes, “The true cost of the Iraq war: $3 trillion and beyond”, Washington Post, September 2010: http://www.washingtonpost.com/wp-dy... .
. Eli Clifton, “Bill for Afghan War could run into the trillions”, Informatiom Clearing House, May 2010: http://www.informationclearinghouse... .
. Gideon Polya, “Carbon burning, Zionism and war kill 1 million Americans yearly”, Newsvine, 2008: http://gpolya.newsvine.com/_news/20... .
. Gideon Polya, “The Awful Truth”, National Indigenous Times, June 2007: http://www.nit.com.au/news/story.as... .
. Aboriginal Genocide: https://sites.google.com/site/abori... .
. Gideon Polya, “Body Count. Global avoidable mortality since 1950” (G.M. Polya, Melbourne, 2007): http://globalavoidablemortality.blo... .
. Climate Genocide: https://sites.google.com/site/clima... .
. Professor Hans Joachim Schellnhuber, Potsdam Institute for Climate Impact research, Terra Quasi-Incognita: Beyond the 2 degree C line, International Climate Conference, 28-30 September 2009, Oxford , UK: http://www.eci.ox.ac.uk/4degrees/pp... .
. Beyond Zero Emissions, “Zero Carbon Australia Stationary Energy Plan”, July 2010 (for free download see: http://beyondzeroemissions.org/abou... .
. UN Genocide Convention: http://www.edwebproject.org/sidesho... .
. Geneva Convention Relative to the Protection of Civilian Persons in Time of War: http://www.unhchr.ch/html/menu3/b/92.htm .
. 9 January 2010 Formal Complaint by Dr Gideon Polya to the International Criminal Court (ICC) re US Alliance Palestinian, Iraqi, Afghan, Muslim, Aboriginal, Biofuel and Climate Genocides: https://sites.google.com/site/pales... .
12.09.2010: Who made Kabul corrupt?